This is the User Guide for the TellyMate. It covers all variants of the TellyMate. In order to make the User Guide easier to use, we've split the contents into sections, available through the links shown above. 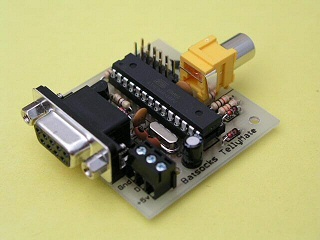 The TellyMate is a Serial to TV adapter. It outputs a PAL or NTSC composite video signal to create a 38 by 25 character monochrome display on a television. The TellyMate Shield has been available in three main versions; Original, board 1.1 and board 1.2. The original TellyMate Shield had a circuit board made by Batsocks and had only 6 jumpers. Version 1.1 of the TellyMate had a professionally made green PCB and has 7 jumpers. It is capable of transmiting data back to the Arduino. Version 1.2 of the TellyMate Shield has DIL switches instead of jumpers, has a surface-mount Mega328 running things and includes the 4 Aux pins originally introduced on the TellyMate Tiny. TellyMate TTL Kit no longer available. 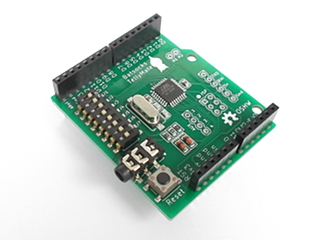 The TellyMate TTL Kit is supplied by Batsocks for home soldering. It has a yellow phono/rca socket for output and various 0.1" header pins for power and data. It was designed primarily for direct connection to 5v microcontrollers. With the appropriate headers soldered underneath the board, it can be plugged into an Arduino ( but it couldn't really be described as an 'Arduino Shield'). It is capable of returning data back to the user. TellyMate Tiny TTL This is the smallest variant of the TellyMate circuit with a footprint of just 19mm x 21mm (without headers). It uses a very small 3.5mm jack socket to output the TV signal. Inputs are via the header pins. 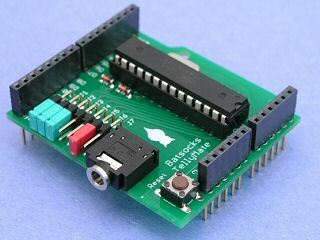 It was designed for direct connection to 5v microcontrollers. It introduces 4 Aux pins which can be controlled as input or output via control sequences. It is capable of returning data back to the user. The original TellyMate Kit was supplied by Batsocks for home soldering. It had a yellow phono/rca socket for output and a 9-pin serial connector as the primary input. The source material required to make your own TellyMate is available for download (see the main TellyMate page) and is covered by simple licenses. Please go ahead and make your own! - Let us know what you do with it!. The only caveat we have is that the name TellyMate is a trademark. It shouldn't be used without an explicit licence. Please see the 'about us' page for further details. If we've missed something out, we're not making sense or have just plain got something wrong, let us know. 10/07/2017 Added details and pictures of the Mega328 based TellyMate shield (board v1.2). 07/02/2012 Added picture and brief details of the TellyMate Tiny TTL variant. "Enable Transmission" example code tweaked for compatibility with Arduino 1.0. 18/09/2010 Added description + picture of TellyMate TTL Kit. 31/07/2009 Fixed error with <CAN> hex value. 20/06/2009 Added "Send Data" and "Send Character At" sequences (new in firmware 1.0.10). Added notes on differences between original and 1.1 versions of the TellyMate shield. 09/06/2009 Send Character and Transmit-enable sequences added. 'Retrieving data from the TellyMate' section added. 10/03/2009 Changed meaning of J6 (see note below). Comments on 'Jumpers' section of <ESC>Q removed. 12/02/2009 Added baud rate accuracy note. Added 'Diagnostic Information' escape sequence. Added 'maximum speed' note.